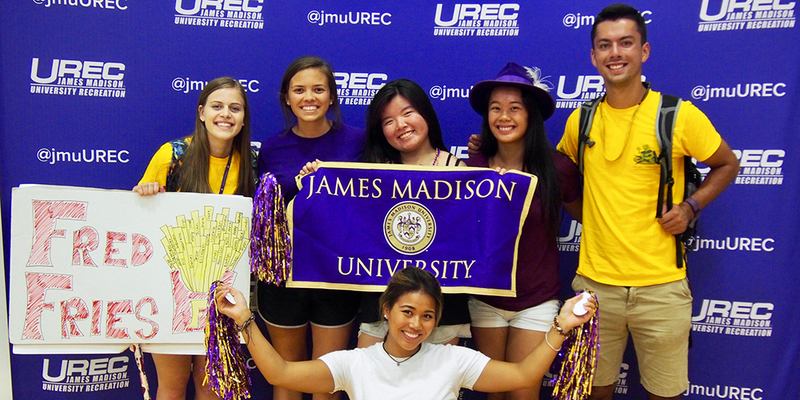 Each year, UREC hosts a welcome event for new students (first year and new transfer students) during JMU 1787 Orientation. Explore the most visited building on campus before classes begin! Join in the fun by swimming and playing in the pools, climbing in the Adventure Center, playing a pick-up sport, or trying a group exercise class. This year, see The World's Leading Mindreader, Banachek, for a 45 minute show in Sports Forum 2 at 10pm. Food, music and giveaways will be available! If you plan to work out or swim, please wear appropriate attire. Your JACard is your admission ticket. Climb on both of our rock walls and boulder in the Adventure Center. Try the inflatable obstacle course, log rolling, pool volleyball, and pool basketball in one of our two pools. Grab something to eat in the Demonstration Kitchen or West Courtyard. Learn about Intramural Sports and compete in the three point contest, soccer darts, or inflatable obstacle course in MAC 3. Try a shortened barre, cardio dance party, yoga, small group training, TRX, or cycle in one of the group exercise studios. Work out in the Fitness Center or on the Cardio Deck. Remember to dress in appropriate athletic clothing and footwear in order to work out. Check out The World's Leading Mindreader, Banachek, in Sports Forum 2. Play pick-up sports including volleyball, big pink volleyball, basketball in MAC 1 and 2, pickleball and badminton in Sports Forum 1, table tennis, racquetball, and wallyball in the Racquetball Courts. Drop in and play a few of the Intramural Sports offered at JMU and learn how to sign up! We will have mini-soccer, kickball, wiffleball, and flag football available!